The outsider appeal of Nayib Bukele, the former mayor of San Salvador and current Salvadoran presidential candidate, certainly appears to be helping him in the polls, according to Gallup. Whether Salvadorans go with a third-party candidate or maintain the status quo, El Salvador’s next president needs to restore the trust of a constituency that has little faith in its leaders and in the honesty of the elections that put them there. In 2009, following the country’s first political party transition from right-wing ARENA to leftist FMLN, a record-high 52% of Salvadorans expressed confidence in the honesty of their elections. Since then, Salvadorans’ trust in the electoral process has been in decline, while their perception of corruption has climbed. 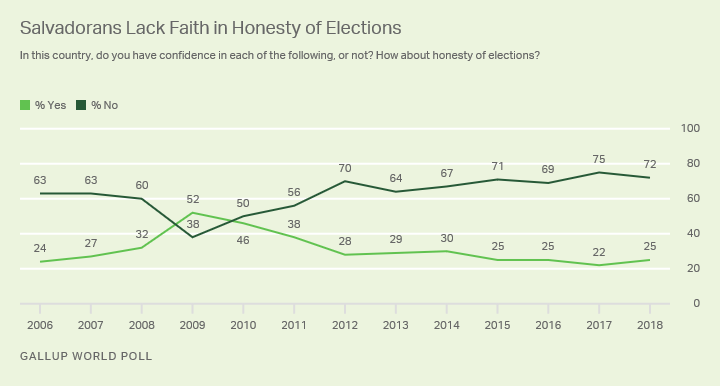 Only a quarter of constituents currently believe elections are honest — less than half of what it was in 2009 — and perception of government corruption has mushroomed from 52% to 77%. The outgoing FMLN president’s low approval rating and polls showing the 2019 FMLN candidate in a distant third place have created a timely opening for Bukele’s anti-corruption message and lesser-known GANA affiliation. The incoming president will have to face citizens’ growing dissatisfaction with how poverty is being dealt with in their country. Just one in three Salvadorans (32%) are satisfied with their country’s efforts to deal with the more than 30% of the country’s population that lives in poverty. Both Bukele and Calleja, at the top of the polls, include commitments to helping the poor in their messaging. This problem, along with concerns about safety, corruption and government inefficacy, contributes to the high numbers of Salvadorans who have wanted to leave the country — if they could — over the past five years. The 51% of Salvadorans who said in 2018 that they would like to move permanently to another country if they could was the second highest in the region, after Haiti (60%). As is typical among the most mobile parts of the population, Salvadorans between the ages of 15 and 29 are the most likely to report a desire to leave the country permanently. Sixty percent of this group would leave if they could. This creates a testing ground for Bukele’s approach of appealing to young people through his social reconstruction plans. Bukele has been promoting an agenda of social development — as he did as mayor of San Salvador, where he created libraries, sports programs and public spaces for urban activities like skateboarding and graffiti art to deter young people from delinquency. Calleja emphasizes improving the education system and leveraging technology to enable Salvadoran entrepreneurs to reach markets outside of their immediate communities. Read the full post from Gallup here.